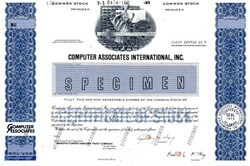 Beautifully engraved specimen certificate from the Computer Associates International, Inc. printed in 1989. This historic document was printed by the American Banknote Company and has an ornate border around it with a vignette of an allegorical woman in front of an abacus. This item has the printed signatures of the Company�s President, Anthony Wang and Secretary, and is over 27 years old. Company Perspectives: Computer Associates International, Inc. is a leading eBusiness software company. CA's world-class solutions address all aspects of eBusiness Process Management, Information Management, and Infrastructure Management in six focus areas: Enterprise Management, Security, Storage, eBusiness Transformation and Integration, Portal and Knowledge Management, and Predictive Analysis and Visualization. Founded in 1976, CA serves organizations in more than 100 countries, including 99% of Fortune 500 companies. 1976: Charles Wang and partners start CA International as a joint venture with the Swiss firm Computer Associates (CA). 1980: Wang and partners buy the Swiss parent company. 1981: The firm goes public. 1987: CA International acquires rival Uccel for $830 million. 1995: CA International acquires Virginia-based competitor Legent for $1.78 billion. 2000: Founder Wang resigns as CEO. Company History: Computer Associates International, Inc. (CA) is one of the largest computer software vendors in the world. The company sells over 1,200 different products, most of which are designed for businesses rather than home computer users. Because the majority of its products are behind-the-scenes workhorses designed to help big computer networks function, CA's specialty is often called "plumbing" in the software industry. Approximately half of the company's revenue derives from products associated with mainframe computers. CA is the market leader in designing software for managing corporate networks. The company also has a large share of the market for data security and data storage. Other products manage data for wireless networks and run Internet applications. Over 95 percent of Fortune 500 companies use CA software. The company grew enormously through acquisitions, buying up some 60 companies in its first 20 years. Founder Charles Wang gave up the chief executive position in 2000, but remains chairman of the board.